Orientation: Well oriented site and building along cardinal directions. Glazing coordinated to take advantage of building orientation. Daylighting : South glazing provided with horizontal shades. Almost no east and west openings. Reasonable north glazing with vertical shading. 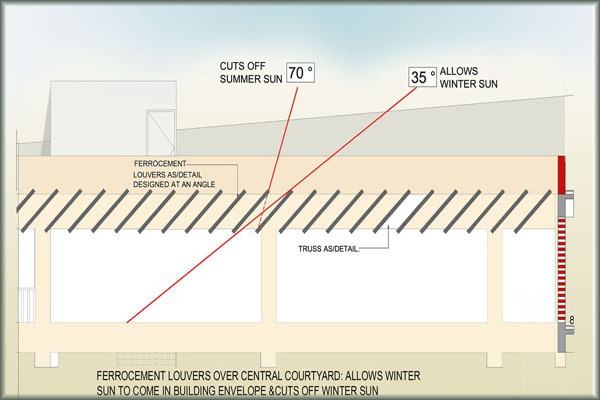 The courtyard is covered with angled louvers that maximize winter sun on the south face of the north wing and shade the atrium in the summer while allowing diffused daylight in. All workspaces of the building are daylit. Efficient lighting with 25% reduced lighting energy use. Ventilation: The south face has solar chimneys to aid ventilation in some of the non air conditioned spaces (which are mist cooled). Spaces divided into zones as per desired temperature set points. 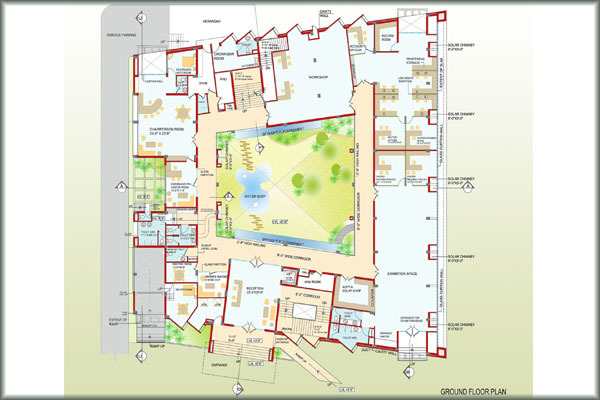 Apex offices (25 ± 1 °C), controlled office and public areas (25 ± 3 °C) and passive zones (25 ± 5 °C). Thermal comfort conditions in apex zones are always maintained through mechanical air conditioning. Controlled zones are cooled in summer and chilled in monsoon. 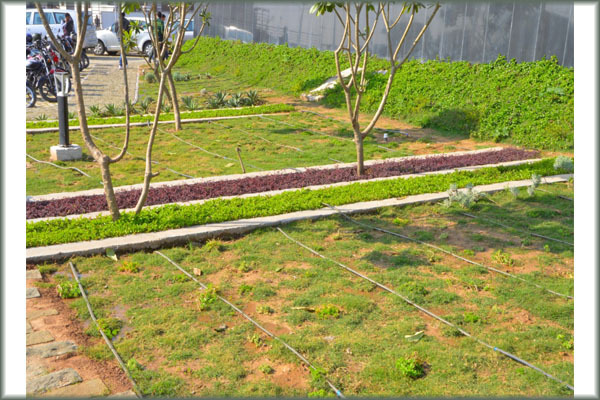 Passive zones are cooled in summer and ventilated in monsoon. 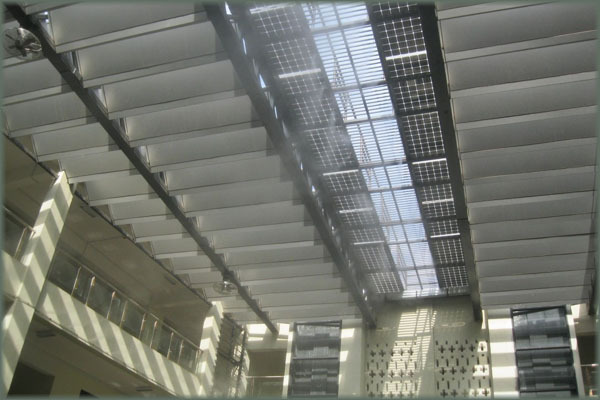 A mist system is installed in the central atrium for cooling of controlled and passive zones. Chilled water supplied at a higher temperature of 15°C. 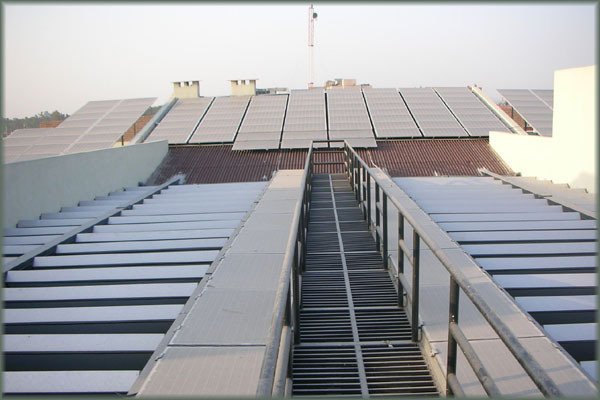 Building Integrated Photovoltaic(BIPV) System with 42.50 kW capacity to supply total annual energy consumption. Total built up area of 55,000 sqft has a connected load of 125 kW which amounts to 2.27 W/sqft. 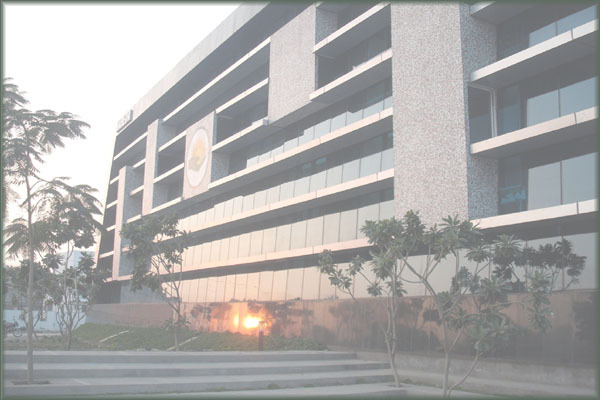 The total simulated energy consumption in the building was13.5 kWh/m2/year compared to a conventional building of 140 kWh/m2/year. Air conditioned area = 477 m2 . 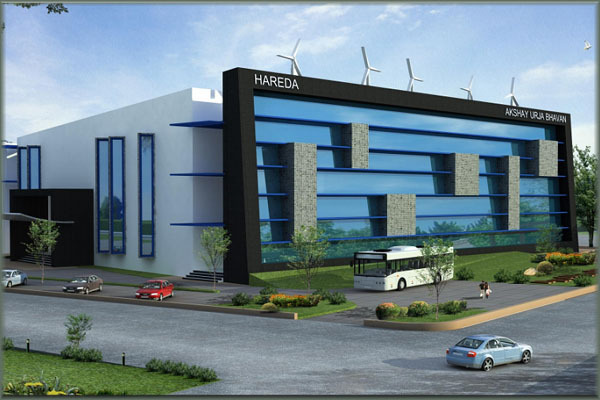 Energy consumption intensity of air conditioned areas is 39 kWh/m2/year. Non air conditioned area = 3637 m2. Energy consumption intensity of non air conditioned area is 7.17 kWh/m2/year.